As a school counselor, your role in class meetings is both facilitator and consultant. Build your knowledge and familiarity with class meetings by learning the basic principles and theory supporting the use of class meetings as a strategy for classroom management and community building. Learn basic facilitation techniques that can be used by school counselors and the teachers with whom they consult. Download accompanying handouts. Describe the basic principles and underlying research supporting the use of class meetings and how they relate to current trends in education. Recognize their unique role as both facilitator and staff-consultant for class meetings. 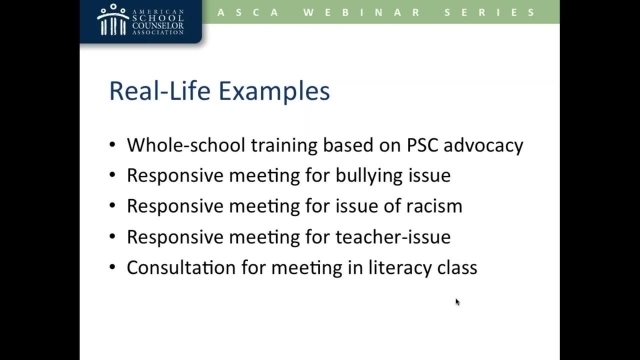 Analyze the components of class meetings and how they support classroom management and class community building. Create a rationale for using effective class meetings within their building/district. Marinda Peters has been an elementary school counselor in Forest Grove, Ore., for eight years in a Title I K-4 school. She is currently transitioning to a middle school counseling position in the same district. In addition to her work as a comprehensive school counselor, Peters serves as her district’s supervisor for elementary school-based mental health school counselor interns. She was appointed as the education chair of the Oregon School Counselor Association (OSCA) in 2014 and was OSCA’s 2014 School Counselor of the Year and state representative for ASCA School Counselor of the Year in 2016.